Navman S90i is preloaded with the latest maps of Western Europe and features a pixel-perfect 4.3-inch widescreen and full 8-digit UK postcode search. The Navman S90i also includes integrated Bluetooth module for safe handsfree calling and a built-in 2 Megapixel digital camera for navigation via NavPix - Navmans innovative navigation by photograph. Navman S90i integrated TMC traffic module, provides real-time route traffic overview and gives an updated snapshot of your whole route, complete with any hold-ups on the road ahead. The Navman S90i also includes a free trial of Navman Safety Camera Data. Navman S90i has been discontinued. Accessories, spares and parts are still available for your S90i, as are road maps. 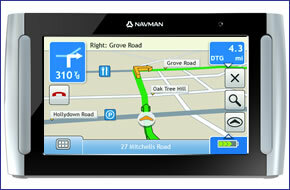 Navman S90i satellite navigation system features maps of 21 Western European countries pre-installed. The Navman S90i also features a brilliant, sharp 4.3-inch colour widescreen touch screen display with turn by turn navigation with voice guided instructions and a full 8-digit UK postcode searches with 2D and 3D moving map display. The Navman S90i also features an integrated Bluetooth module for safe hands free calling, NavPix 2 megapixel digital camera for navigation via images and integrated TMC traffic receiver for real-time traffic information. The Navman S90i also features points of interest, speed camera locations and intelligent day/night display. The Navman S90i is equipped with text-to-speech (TTS). Simple in concept, but a huge leap forward in convenience and safety, TTS enhances audible directions by speaking the actual road names. In doing this it's easier and more intuitive to follow, allowing you to concentrate more on the road ahead while being guided quickly and easily to your destination. The Navman S90i allows for Bluetooth connectivity with compatible mobile phones. Make and receive calls safely and legally while driving - incoming calls are not interrupted by navigation directions and the caller's name is displayed on the screen. Your phone's address book synchronises automatically every time you connect, and if you share your Navman S90i, multiple pairing allows you to connect up to 5 different phones. Finally, with the addition of text-to-speech (TTS) on the Navman S90i you can even have your SMS texts read to you while on the move. The Navman S90i also provides real-time traffic information via the integrated traffic module. The Navman S90i uses the Traffic Message Channel (TMC) which broadcasts real-time traffic and weather information via the FM Radio Data System (RDS). FM radio stations transmit traffic information updates on a regular cycle, particularly around rush hours, with up to hundreds of events broadcasted to TMC receivers. Your Navman S90i will decode these events and display the various events and give you options on how to avoid traffic congestion in the road ahead. The Navman S90i traffic module works in the following European countries: Belgium, Germany, Denmark, France, United Kingdom (except Northern Ireland) and the Netherlands. NavPix Digital Camera - Navigate to pictures with Navman's innovative NavPix feature. The Navman S90i is the only Navman S-Series model with an integrated 2 megapixel digital camera capable of creating NavPix photos. A NavPix photo carries its exact location data, which your Navman uses to navigate to - handy if you don't have the address or postcode of famous places you would like to visit. For example, who knows the exact address of the Eiffel Tower, the Tower of London or the Brandenburg Gate? By combining images with geo-referencing, NavPix lets you use images, such as the Eiffel Tower, as points of interest (POIs). You can then use those NavPix images when planning routes on your Navman S90i. The Navman S90i is pre-loaded with a free trial of the Navman UK speed camera database. The latest safety camera data is fully integrated with the Navman S90i. Colour coded speed camera icons are displayed on the Navman S90i so you can easily recognise the type of speed camera on your route. You can also select your proximity range allowing you to decide when you should be alerted of an approaching speed camera. The Navman S90i has been designed to be Plug and Play, and as such can be transferred from vehicle to vehicle with ease by the user. The Navman S90i is powered with a 12-volt adaptor cable in-car (supplied) and attaches to your vehicles windscreen via the Navman S90i suction mounting bracket which is also included. The Navman S90i includes speed camera locations pre-loaded. Subscribe to monthly updates of speed camera locations for the United Kingdom. Subscription to the Navman UK speed camera database is priced at £24.95 for 1 year or £49.90 for 3 years. The Navman Western European speed camera database is priced at £29.95 for 1 year. The Navman S90i is complete with the latest Navman 2007.4 TeleAtlas maps to provide detailed street level maps of 21 Western European countries. TeleAtlas Maps provide high quality, detail rich maps, which in addition to street information include features such as route calculation, Points of Interest, Estimated Time of Arrival, and more. The following countries are pre-installed on the Navman S90i: Andorra, Austria, Belgium, Denmark, Finland, France, Germany, Gibraltar, Ireland, Italy, Liechtenstein, Luxembourg, Monaco, Netherlands, Norway, Portugal, San Marino, Spain, Sweden, Switzerland, United Kingdom and Vatican City. Although the Navman S90i has been discontinued, a number of accessories are still available to buy from ActiveGPS. These accessories and spares include: leather carry case, vehicle charger, T2 traffic cradle and connectivity kit.